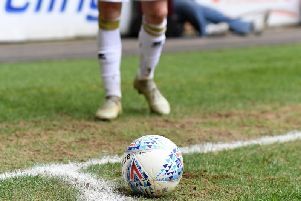 Teenage goalkeeper Charlie Burns was handed his first start in an MK Dons shirt after Cody Cropper’s red card at Preston was not over turned by the FA appeal’s panel. Saturday’s hero Alex Revell, who saved Joe Garner’s penalty, was handed a start at his preferred end of the pitch, while Carl Baker and Jonny Williams returned to the starting line-up. Dons went into the game knowing they had to keep eyes on results other than their own to ensure their return to League 1 was delayed for another game. With all eyes on Burns, there appeared to be no signs of nerves from the young keeper in the early stages at Hillsborough. Cleanly kicking away a couple of early balls, Burns watched on as Daniel Pudil’s volley skidded wide of his upright, while he was given a straight forward catch by Ross Wallace as he struck from outside the box. Neither side were really on top in the opening half hour, with nice stuff being played in midfield without really threatening all out assault on either goal. While Wednesday only tentatively tested Burns, Keiren Westwood at the other end was only tested when Jordan Spence, popping up on the left flank, broke to the byline but fired straight at the keeper. Wednesday played really some attractive football in the centre of the park, making Dons chase and get back in number, but their finishing would ultimately let them down. Alex Lopez sent a wild shot off into the stands before Pudil rattled the frame of the goal with a miscued cross which looped up and over Burns’ despairing dive on the stroke of half time. They hit the frame again 10 minutes into the second half when substitute Atdhe Nuhiu headed against the post as Wednesday began to lay siege to the Dons goal. Fernando Forestieri tested Burns at the near post with a second bite of the cherry, Nuhiu headed over when scoring looked easier and Pudil hit the bar as the sense of urgency and expectancy rose inside Hillsborough. But with the level of expectancy came a level of frustration among the home side. Tom Lees and Gary Hooper were booked, but the turning point came with eight minutes to go. Fernando Forestieri was booked for simulation, when it appeared Kyle McFadzean had fouled him, but an incident off the ball between Jonny Williams and Ross Wallace saw the Dons player sent to the ground, and the Wednesday man sent for an early bath with a red card. Despite being a man down, Wednesday hit the bar for a fourth time in the final minute when Barry Bannan’s free kick hit the frame, but Dons would survive and leave with a point. Sent off: Wallace But a stale first period made way for a thrilling second as the home side piled forward. Tempers flared over when Ross Wallace clashed with Jonny Williams in an off-the-ball incident, earning him a red card with eight minutes to go. With all eyes on Burns, there appeared to be no signs of nerves from the young keeper in the early stages at Hillsborough. Cleanly kicking away a couple of early balls, Burns watched on as Daniel Pudil’s volley skidded wide of his upright, while he was given a straight forward catch by Ross Wallace ashe struck from outside the box. But with the level of expectancy came a level of frustration among the home side. Tom Lees and Gary Hooper were booked, but the turning point came with eight minutes to go. Fernando Forestieri was booked for simulation, when it appeared Kyle McFadzean had fouled him, but an incident off the ball between Jonny Williams and Ross Wallace saw the Dons player sent ot the ground, and the Wednesday man sent for an early bath with a red card.